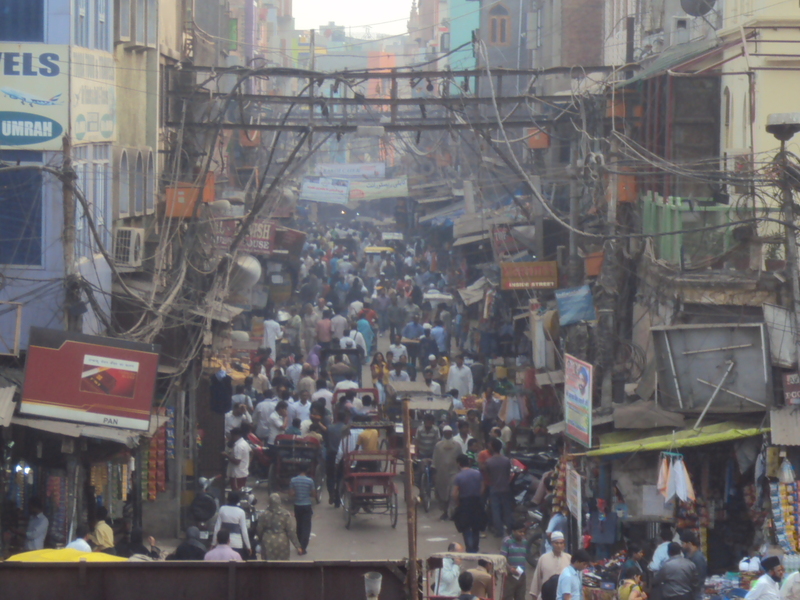 A trip to old Delhi to sample the kebabs and chaats has been on our agenda for a long time. When a friend forwarded a link to Delhi Heritage Walks, it sounded a perfect way of sampling the best the streets had to offer. The heritage element was an added bonus. Priced at Rs 900 per head, the walk entailed 3 heritage stops and 4 food stops. We were all meant to assemble at Gate No.1 of Jama Masjid. Mahesh and Megha were horrified to hear that only vegetarian fare was part of the deal – a fact I shared with them only after we got down at Chawri Bazaar. 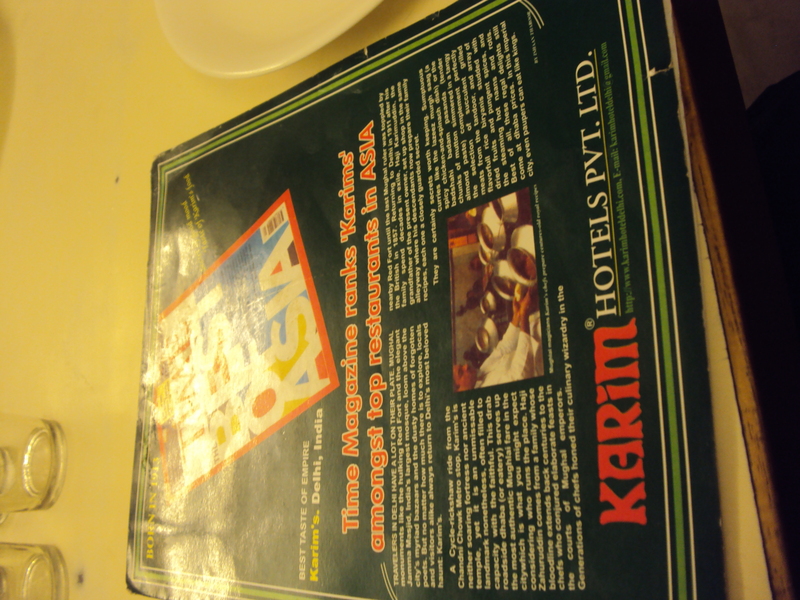 We hopped on to cycle rickshaws outside the station and decided to head to Karim’s first. We go-karted along the crowded lanes to reach our destination. The rickshaw I was on collided with 1 scooter and 3 rickshaws on the way. As our guide told us later, in this part of Delhi “you are always in someone’s way”. Whose Way is it Anyway? We were lucky to find a place (not really a table as we shared our table with 6 others) for 4 and were seated immediately. We ordered 2 rotis, 1 plate of Mutton Qorma, and 2 pieces of seekh kebabs. 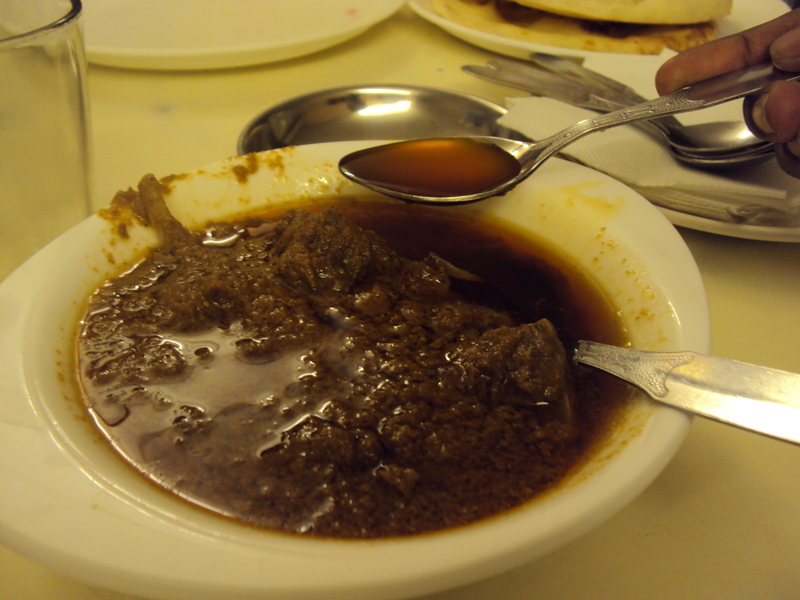 While the qorma gravy was delicious, the mutton was hard and chewy. The yeasty rotis were wonderful. 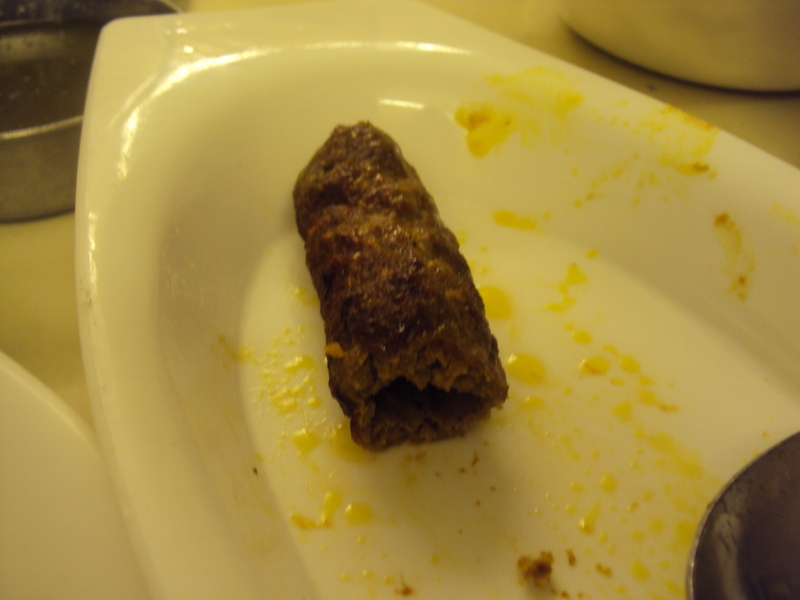 We also liked the soft and sleek seekh kebabs. The plan was to pack dinner from Karim’s a plan that remained unexecuted on this trip. 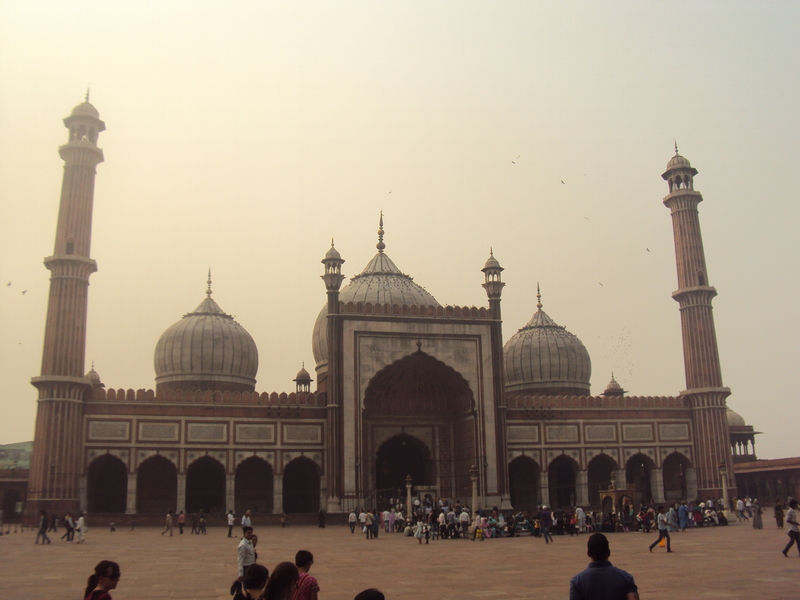 Our first stop on the heritage walk was Jama Masjid. The mosque is breathtaking from the inside. Unfortunately, Mahesh and I were not very impressed with the heritage aspect of the walk. Our experience with Bangalore Walks had raised our expectations. We were looking forward to anecdotes and fun trivia along with a dose of history. We also hoped that the food aspect of the walk would also capture the history of the shops and their creations. Unfortunately, this was missing. A quick online search on all our food stops revealed that there were interesting stories behind most of them. Sharing that with the walkers would have definitely enhanced the experience. Our first stop was the Jain Coffee House. The entry into this place was a dark narrow lane which added to its mystique. We were informed that most of the shop-keepers around the area ordered their lunches from Jain Coffee House. The USP of this joint was its elaborate fruit sandwiches. We sampled chikoo and pineapple sandwiches. 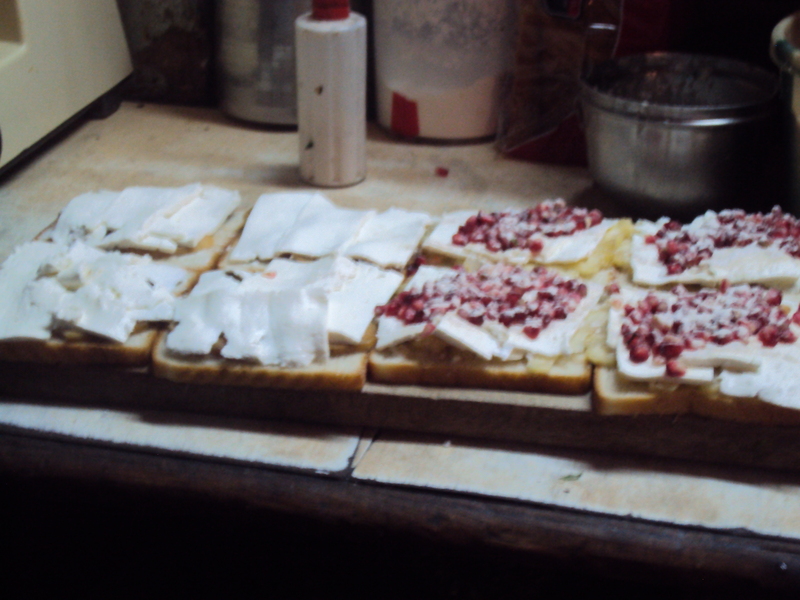 The fruits were sliced, placed on the bread, topped with paneer, butter, pomegranate seeds, and jam. You can read more about this place here and here. We also sampled the samosa sandwich that was topped with paneer and pomegranate and was a tad too salty. The sandwiches are very reasnably priced. 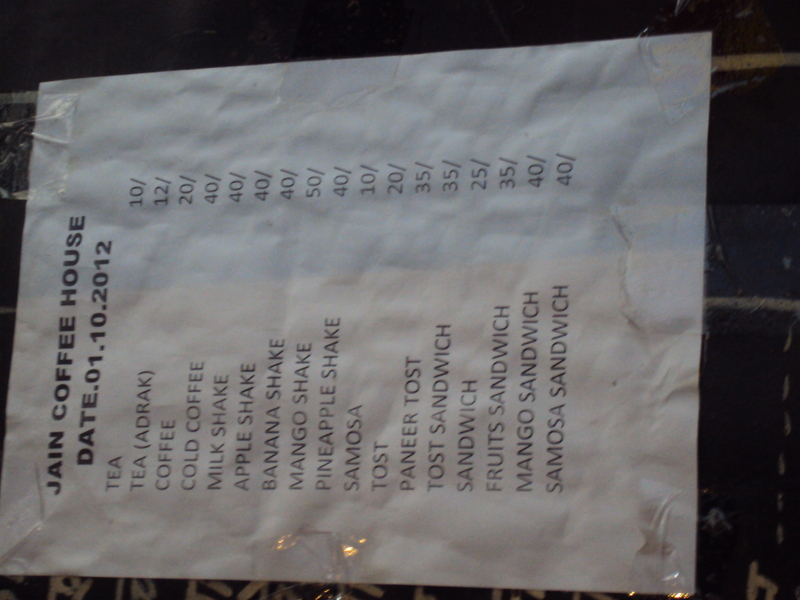 The fruits ones were Rs 35 each and the samosa sandwich Rs 40. Our next food stop was the Hiralal Chaat Corner. 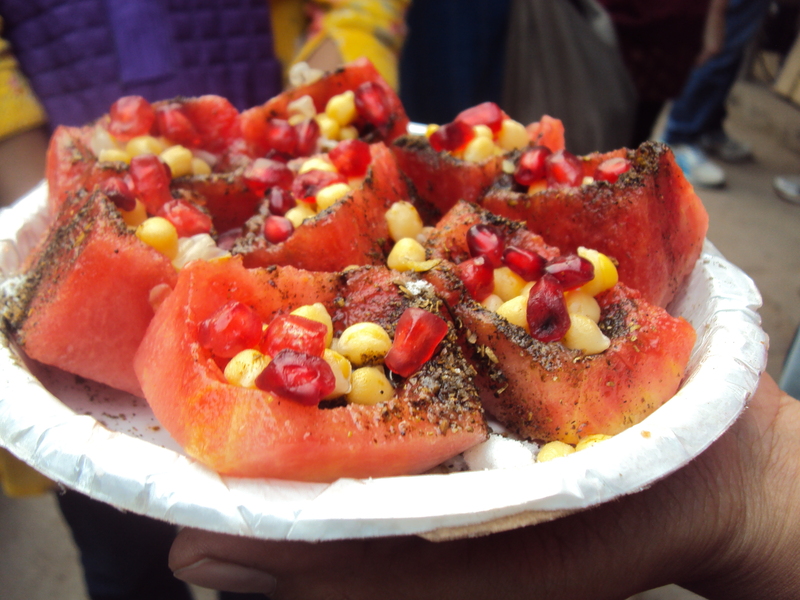 This place really blew our mind away with its Watermelon Kuliya Chaat. 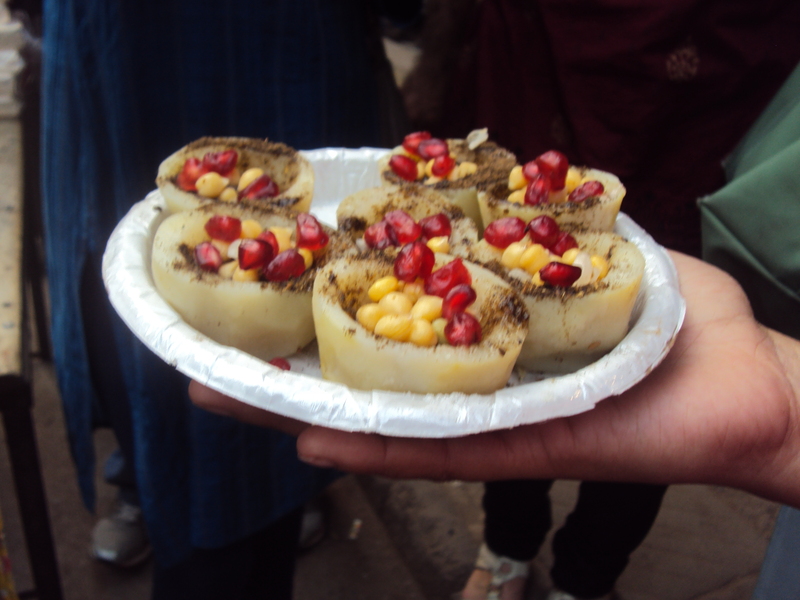 The fruit is cut in cylindrical shapes and the flesh is scooped out to create a pocket which is then filled with boiled channa, pomegranate, chaat masala, rock salt, lemon juice, and other spices. It reminded me of a tangy golgappa minus the crunch of the puri. The contrast of the sweet watermelon and the tangy spices was unbelievably good. You can read more about this place here. 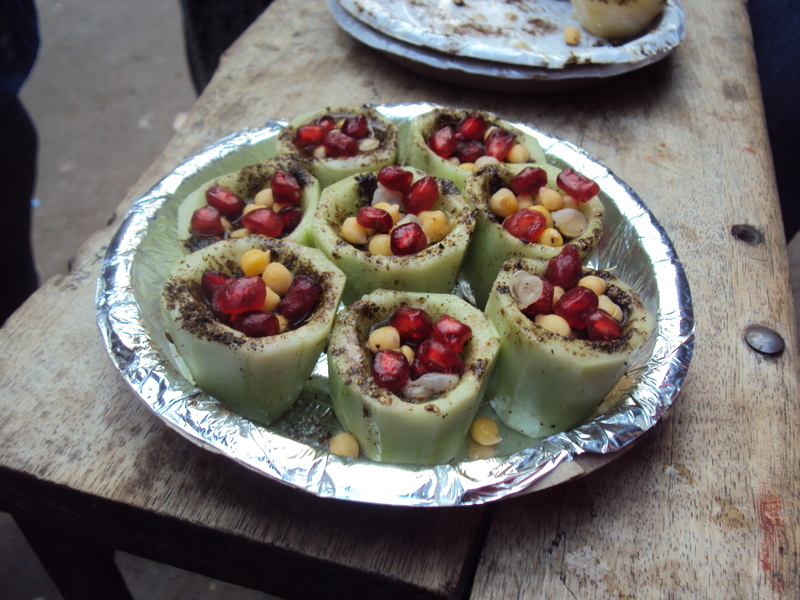 We also tried the potato kuliya and the cucumber kuliya, but they were no match to the watermelon. They have several varieties of kuliya – tomato, banana, apple, and weet potato. We also had the fried potatoes and the alu tikki which were ordinary. Our next stop was Ashok Chaat Corner which was bang opposite the Metro Station. By this time we were quite full. 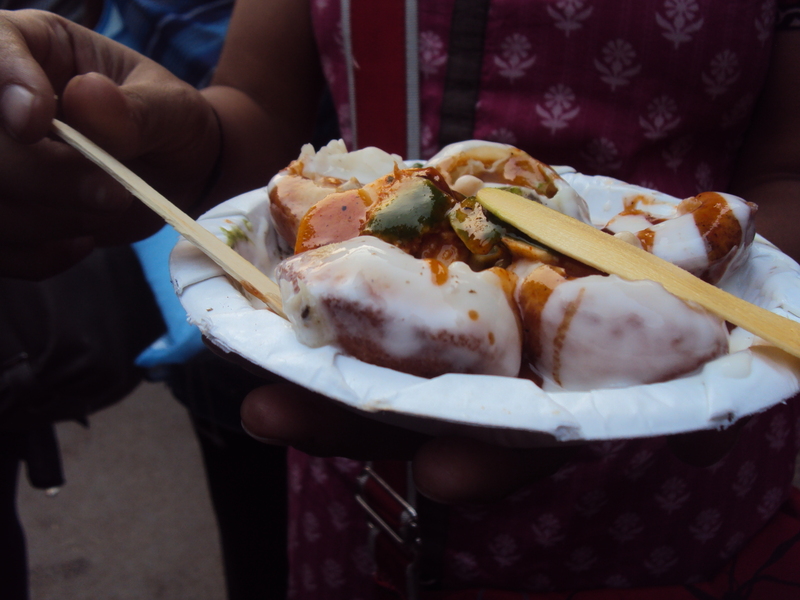 We only sampled a piece of dahi puri chaat. This was again regular stuff and nothing out of the ordinary. 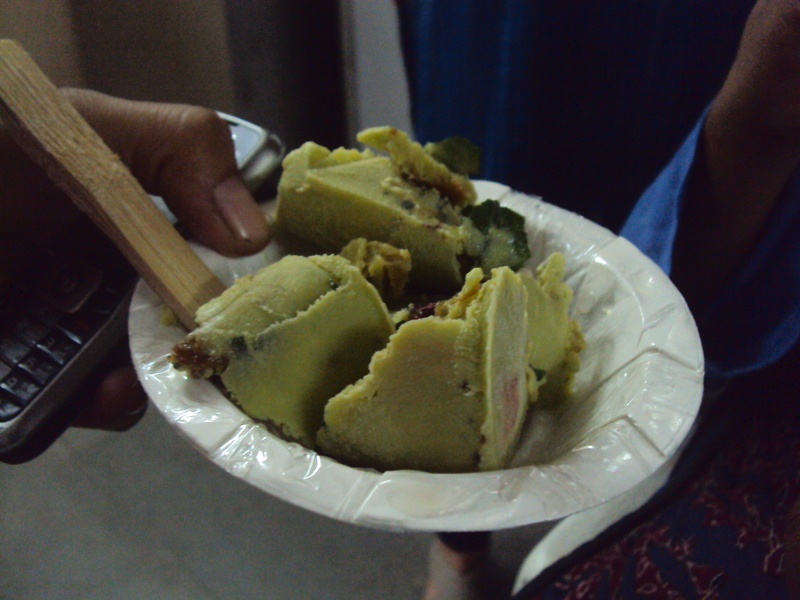 Our last stop was Kuremal Mahavir Prasad Kulfi Wale. 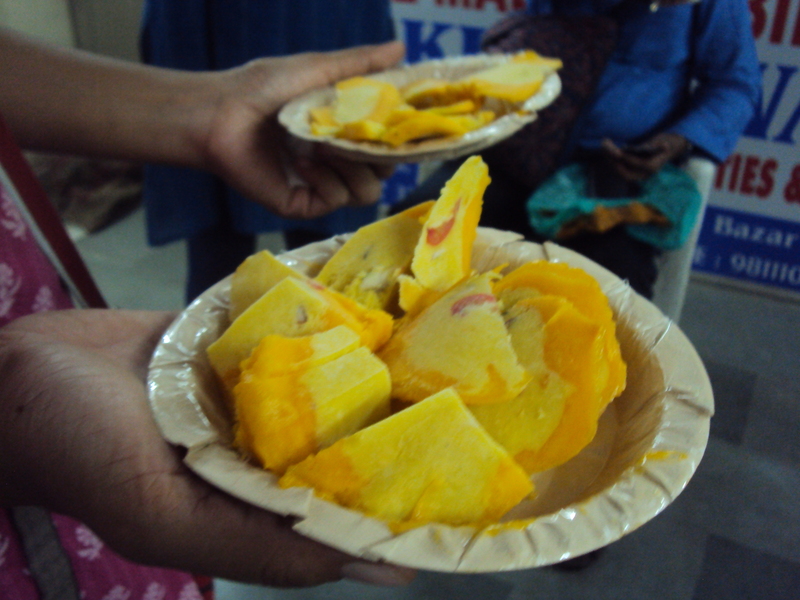 The first kulfi we sampled was the Mango Kulfi. This was no ordinary kulfi. 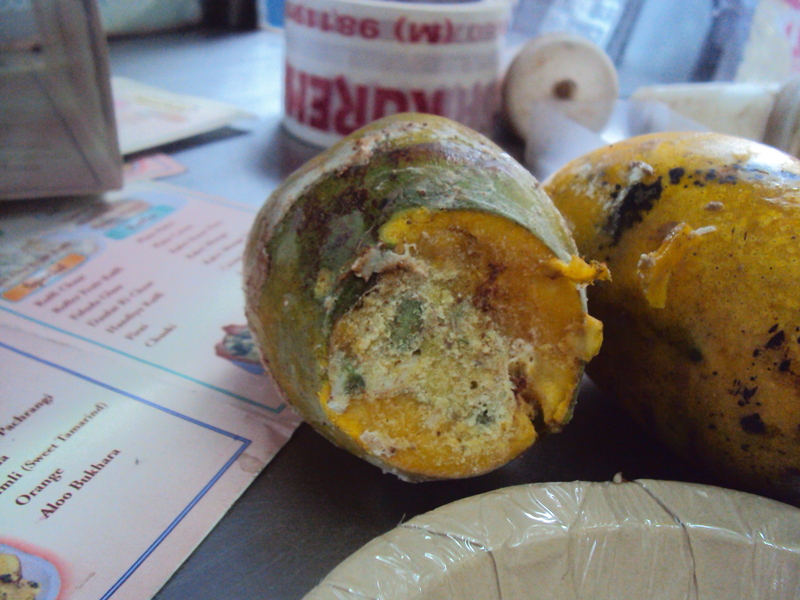 The stone had been removed carefully and luscious kulfi was filled into the cavity of the mango and frozen. I was amazed at how deftly the stone had been removed by hand. You can read more about this place here. 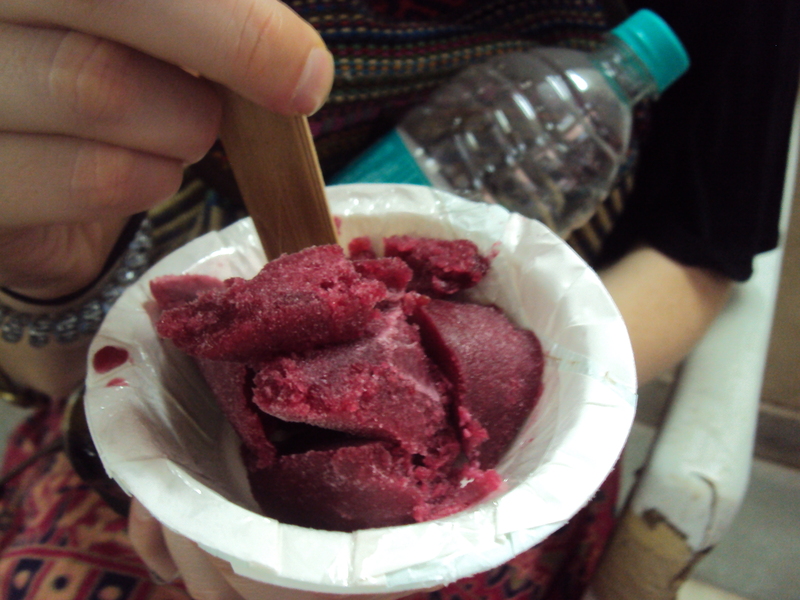 We also sampled other flavours such as falsa, jamun, sitaphal, chiku, and paan. 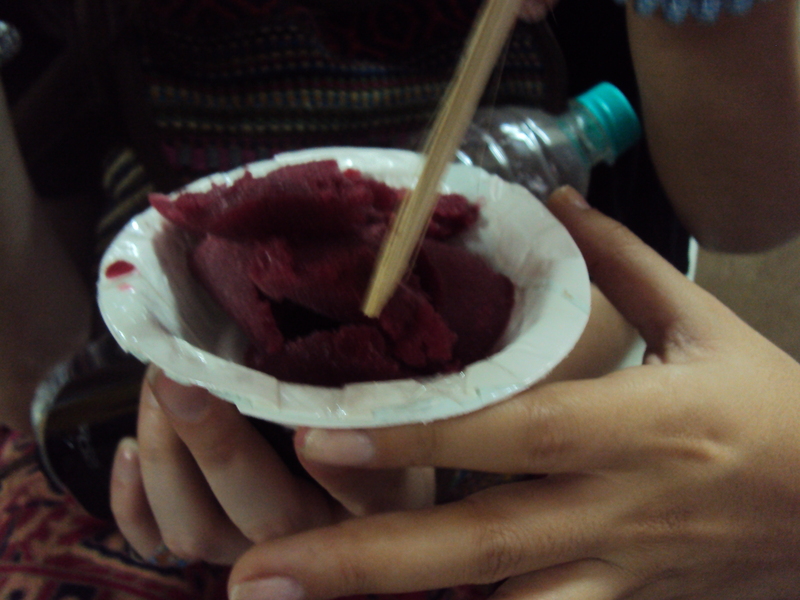 The texture of the fruit flavoured kulfis were like that of a sorbet. Mahesh and I loved the paan kulfi and the mango one. We intend on coming back for the kulfi and the watermelon kuliya and of course Karim’s!